Winter sports are winding up here in Australia, with semi finals and finals either already played or being played on upcoming weekends. 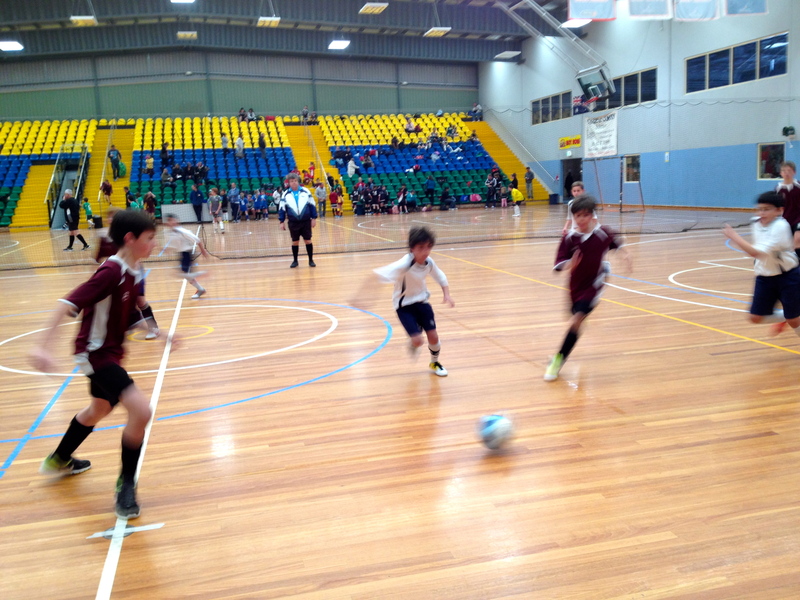 Last week was busy with both school and weekend sports being played in extremely unpleasant conditions! It was freezing cold, windy and rainy! My son’s (last kid on the right!) school soccer team won another badge to sew on their shorts! 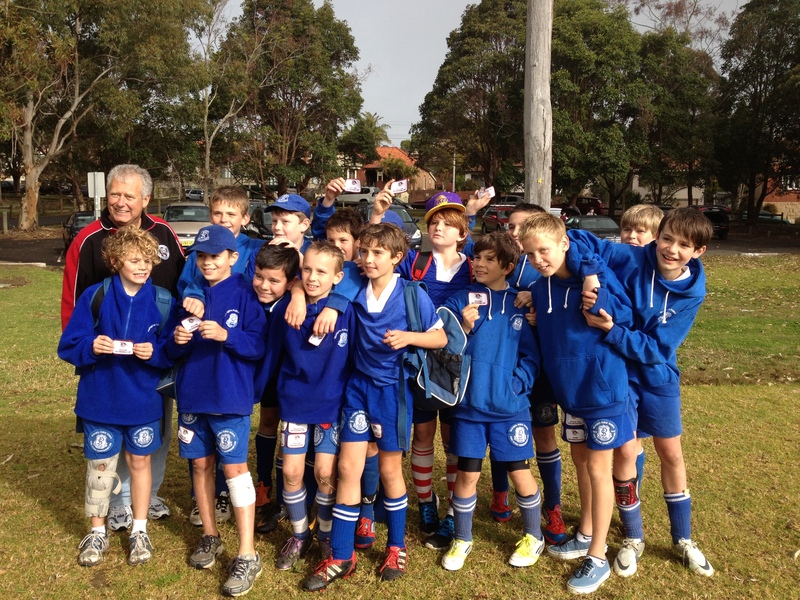 The following day his weekend soccer team played in more rain and wind to secure a place in the semi finals. 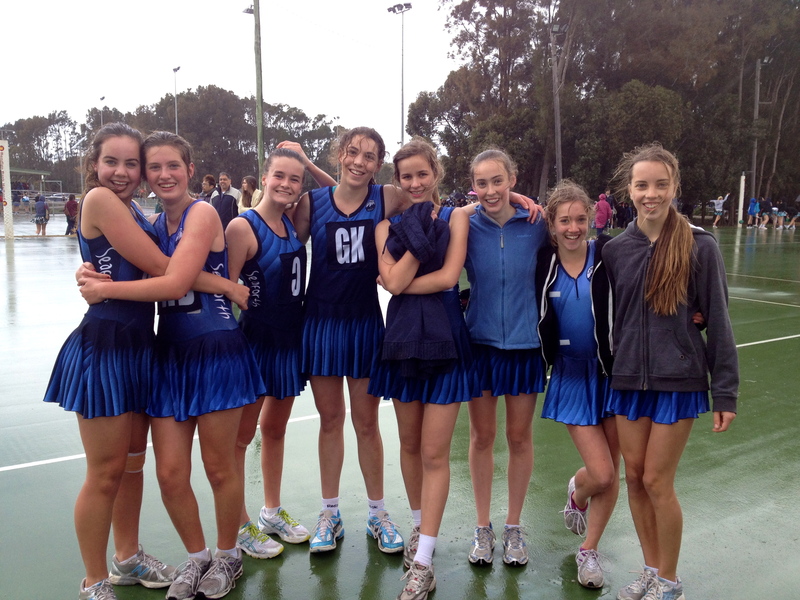 My daughter’s netball team also secured a spot in the semi finals on the same day (she’s fourth from the right). 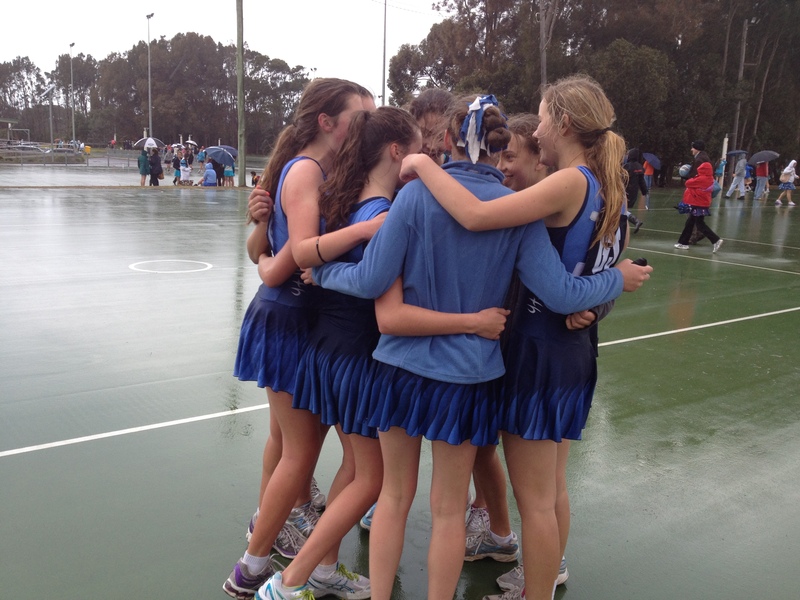 The horrible weather forgotten after a close win! 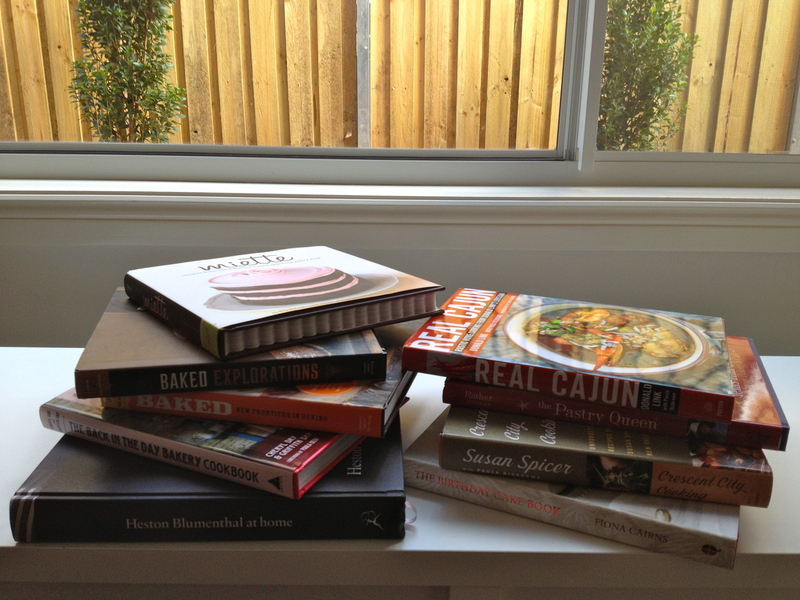 I would pick up one of my beloved cookbooks and longingly, lovingly caress the pages. Making a mental list of what I would make as soon as I had the time gave me butterflies. These stolen moments of pleasure fed me. So while I dreamed of spending hours playing in the kitchen. I was relieved to see that this week’s French Fridays with Dorie recipe was a quick and simple cafe style grated carrot salad. I served this salad with Donna Hay’s equally quick and easy Ham, Leek and Cheddar ‘Impossible’ Pie. 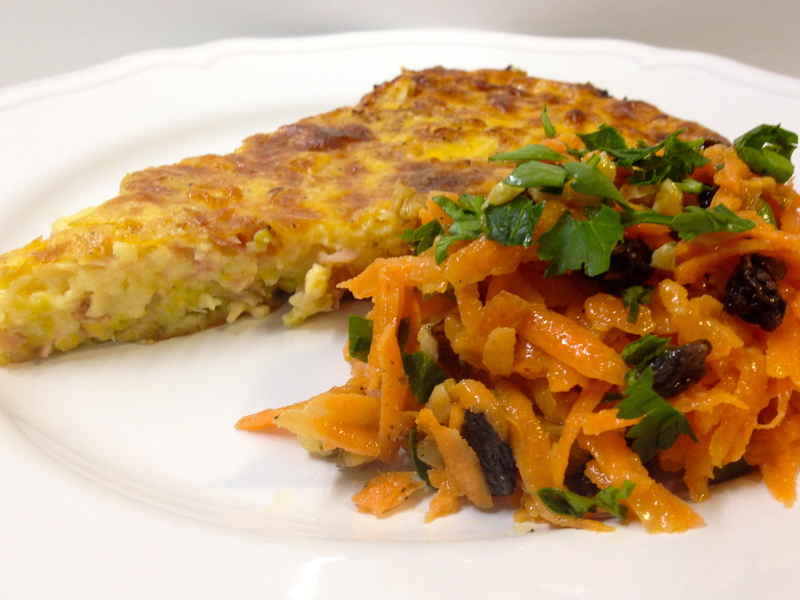 The saltiness of the pie contrasted beautifully with the sweetness of the carrot side salad. I made Dorie’s carrot salad with all the extra options. I added the raisins, walnuts and parsley. My husband and I thoroughly enjoyed it! It was simple, light and delicious. Just what we needed! I made a greek salad for the kids (it was too long a week to be fighting over what sort of salad would have raisins and nuts in it!). However they asked if they could add the vinaigrette to the greek salad! A compromise was reached and we were all happy! 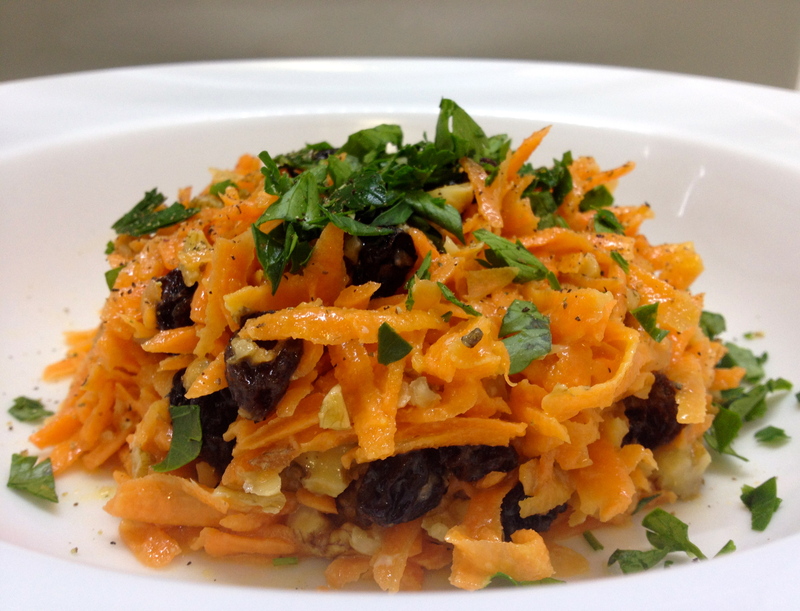 To check out what the rest of the French Fridays with Dorie group thought of this carrot salad, click here! 2. Heat the oil in a non-stick frying pan over high heat. Add the leek and garlic and cook 5-7 minutes until golden and softened. Sprinkle with salt and pepper and set aside. 3. Place the eggs and flour in a bowl and whisk well to combine. 4. Gradually add the milk and whisk to combine. 5. Place the leek, ham and cheese in a lightly greased 24 cm round ovenproof baking dish. 6. Pour over the milk mixture, sprinkle with salt and pepper and cover loosely with aluminium foil. 7. Cook for 30 minutes, uncover and cook for a further 30-35 minutes or until cooked through. Tags: baking, cooking, food, french fridays with dorie, my life, recipes, salads | Permalink. Lovely meal – and that “impossible” pie sounds wonderful. Your salad is beautiful, of course, how could it not be, right? We really liked the salad as well. Loved this post…fun to see the sports pictures…we are a sports family as well, although my son is now in college swimming there…also fun to see the different seasons with Australia. Four of us are cooking Donna Hay recipes on Wednesdays…we started in January, took May through August off, started up again last week. Our fearless leader is Gaye, also from Australia, like you. If you are interested in joining in, just give a shout whenever you make the weekly recipe (posted on my blog for the next week) and we will link you…we aren’t an official group so you can join in any time something looks good and workable for you. Two good recipes for a perfect meal! Enjoy the weekend! Wonderful sporting family. Our weather is wonderful right now in the NorthEast of the US. Dry, breezy and warm. I agree your pie is perfect complement to the carrot salad. I am pinning it and making it soon. I’m drooling over the pie! Yum! Your salad looks wonderful:) Congratulations to your kids. Thank you for posting the recipe for “Impossible Pie”. I am going to make it next week – it looks and sounds delicious! Nice pairing with the pie – thanks for sharing the recipe! I love being reminded that weather and seasons are different on opposite sides of the world. I didn’t enjoy the salad as much as I wanted to, but your impossible pie looks like something I’d like to try. Oh, I know the feeling of looking longingly at my cookbooks. Hope you find some time for yours soon. pie. Funny, but I just baked a zucchini “Impossible” pie with Bisquick.